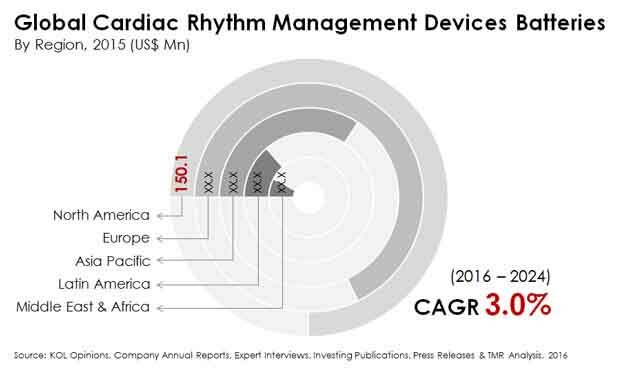 As the availability of safer and cheaper lithium batteries is increasing, the global market for cardiac rhythm management (CRM) devices batteries is likely to attain new heights. CRM devices are designed to improve the health of patients with either too fast or too slow heartbeats. These devices are placed in the chests of patients suffering from arrhythmias or irregular heart rhythms. When a patient suffers from arrhythmias for too long, his/her heart cannot pump enough blood to the body, resulting in emergency situations, and even death. As these devices are powered by batteries, the demand for these devices will reflect in increased demand for these batteries. According to the findings of Transparency Market Research (TMR), the global market for CRM devices batteries was valued at US$397.3 mn in 2015. The market is expected to expand at a CAGR of 3.0% between 2015 and 2024, reaching US$518.4 mn towards the end of 2024. North America holds a strong position in the market presently, by virtue of its highly developed healthcare infrastructure and greater incidence of arrhythmias. The rising number of CRM implants is the prominent factor boosting the market for CRM devices batteries in this region. According to the findings of the U.S. CDC, nearly 750,000 hospitalizations each year in the U.S. are attributed to atrial fibrillation, the most common form of arrhythmia. The mortality rate associated with this condition was 130,000 deaths every year. The 2014 study also highlighted that as many as 2.7 to 6.1 million American citizens had atrial fibrillation. As a result, the number of CRM devices implants are slated to increase even further. Asia Pacific is another region with great potential. The increasing healthcare expenditures of governments, growing per capita incomes of the middle class, and high prevalence of heart diseases, and growing awareness about heart diseases has been driving the market in Asia Pacific. Moreover, the development of highly efficient, technologically advanced CRM devices has been scooping out more demand. The increasing prevalence of cardiovascular diseases and sudden cardiac arrests will ensure that the demand for these products will continue to grow in China and India. Based on product type, the global market for CRM devices batteries has been segmented into cardiac resynchronization therapy devices, implantable cardiac pacemakers, and implantable cardioverter defibrillator. Implantable cardioverter defibrillator (ICD) is a device that records the heart rate of patients. The ICD is connected to the chambers of heart via two thin wires. As the heart beats, electric signals are sent to the ICD. As soon as an abnormal heartbeat is detected by this device, it aids the heart restore its normal pace. Cardiac defibrillation uses an electric shock to do this. An implantable cardiac pacemaker (ICP), on the other hand, is a small device that assists the heart to produce more regular heartbeats with the help of a small electric stimulation. Both of these devices are typically placed under the skin of chest, below the collarbone. A cardiac resynchronization therapy device can be a half-dollar sized pacemaker that ‘resynchronizes’ the heart. As these devices improve the blood flow and efficiency of the heart, several heart patients suffering with moderate to severe symptoms are using these devices. The efforts of ongoing research and development projects will come to fruition, producing next-generation CRM devices with efficient batteries. The batteries used in the aforementioned devices are expected to undergo significant transformations and upgrading, thereby accelerating demand. Some of the major companies operating in the global market for CRM devices batteries are EaglePicher Technologies, Boston Scientific Corporation, BIOTRONIK SE & Co. KG, Greatbatch, Inc. (Integer), Quallion LLC, Medtronic, and St. Jude Medical, Inc. Rising prevalence of arrhythmic patients globally have resulted in increasing number of CRM devices implantations thus, escalating the market growth over the forecast period. CRM devices are placed in the upper chest of the patient’s body to help control irregular heartbeats or arrhythmias. Arrhythmias can arise as a result of several reasons including myocardial infarction, myocardial ischemia or due to electrolyte imbalance and drug toxicity. CRM devices are battery powered devices that help keep track on heartbeats of a patient. These include, ICD’s, ICP’s and CRT devices. Most of the CRM device manufacturers sell their own batteries and have begun to capitalize on improving their overall battery performance so as to extend the lifecycle of their CRM devices. This has led to substantial increase in production capacity of batteries in the near future. CRM devices are powered by various battery chemistries. However, newer devices that utilize lithium manganese dioxide do not suffer with the midlife charge time issue that has increased their sales significantly. Also, introduction of leadless pacing have pushed the battery manufacturers to introduce batteries with improved chemistry and technology further driving the revenues in global CRM device batteries market.